For those of you who need a daily lamb fix this time of year. 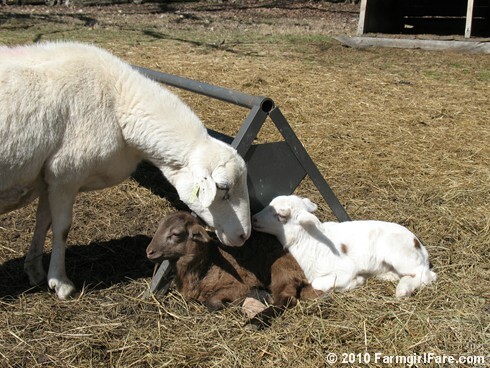 © Copyright 2010 FarmgirlFare.com, the happy to be of cute service foodie farm blog where there may be only two sets of twins on the ground, but the lambing season pics are already piling up. I found your blog about 8 months ago or so and I love it. Your pics are wonderful. I am so jealous of your farm. What type of camera do you use? I always check your page 3 or 4 times a week. Your new twins there are so precious. Babies! Babies! Babies! I can't get enough of them! You know, these pictures kinda make my day. There is nothing better than mama's and babies. Sooo cute!